This is what the box die turns out like. Very pretty, and would make a great gift box for small jewellery or a couple of chocolates or something. I think I’ve figured out how to make the larger one work, it just needs some surgery first. I have to finish this box off, yet with an embellishment and ribbon for a handle. I think I’ll be making a few of these to have on hand for future gift giving. 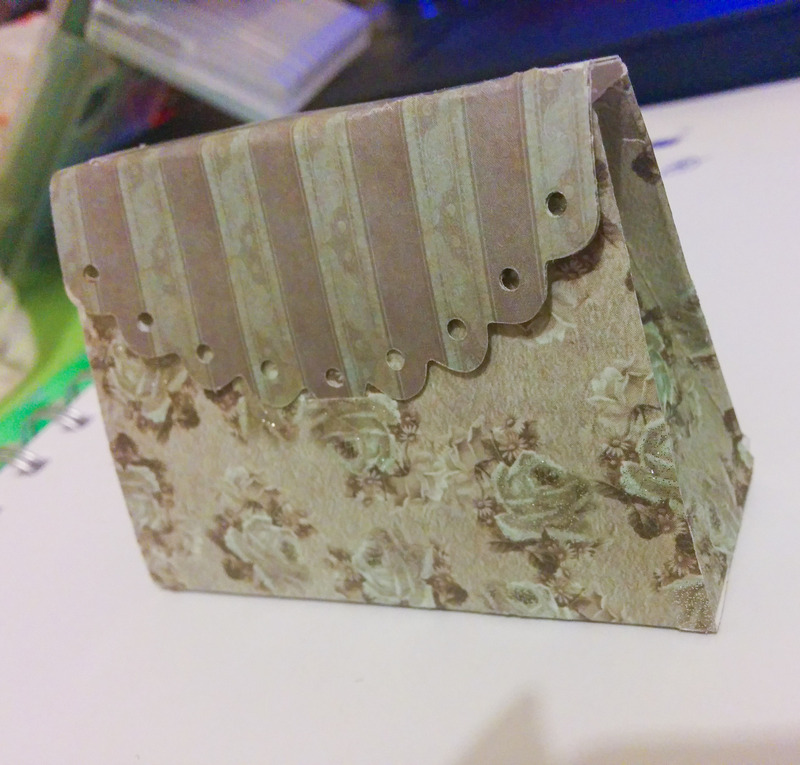 I also had a go at making myself an embossing folder for my big shot. It worked surprisingly well, considering last time I tried one, it failed completely. To make this, you die cut a pattern out of card from a food box, keeping all the pieces. Then, lining them up over another piece of card, you glue in the pieces in the slots, so they match up completely, taping the two rectangular pieces together so it hinges and lines up. 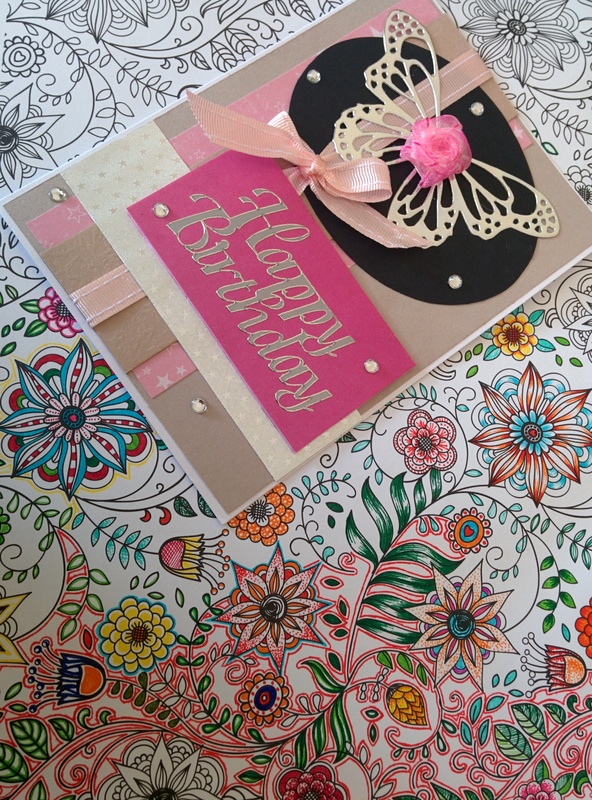 Then you can use it as a regular embossing folder. You might have to play around with the shim plates and bulking with card to get the right amount of pressure through the machine, as this isn’t as thick as a regular embossing folder. 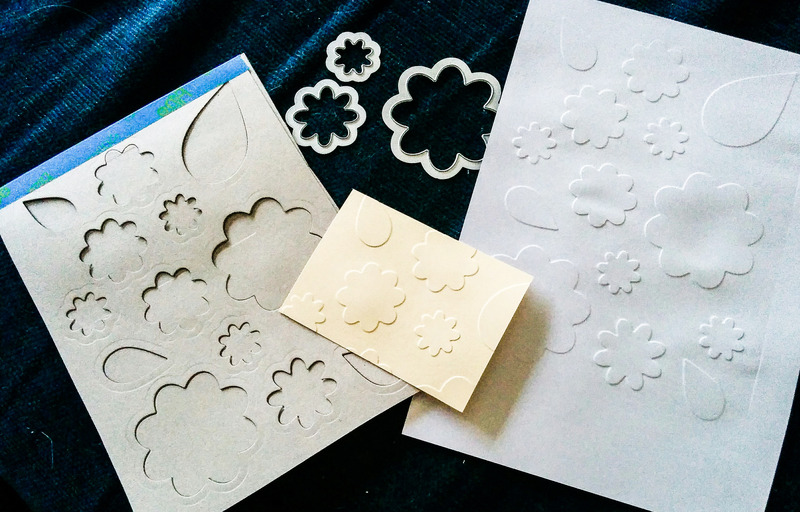 I’ll also have to try making my own embossing diffuser plates. Lately, my art endeavours have taken me to a far land, where I spend my time between colouring and die cutting circles to draw on. My first intent was to make cardboard pendants for jewellery, but it has developed into just drawing on a load of circles, without fear of messing up. If it looks good, I can use it, if it doesn’t look good, I learn and start in the next circle. 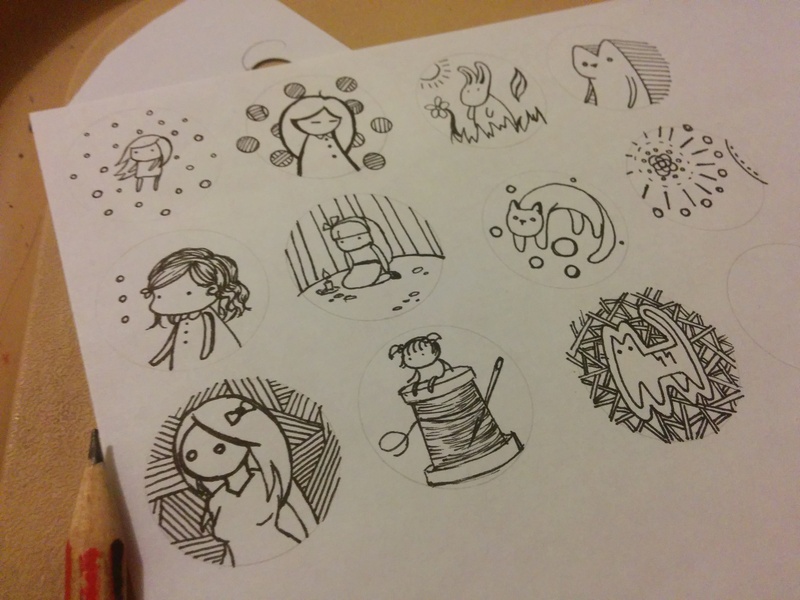 There isn’t the worry of filling a whole page, and I can use these as stickers, colour then in or scan them. I’ve had a few really cute ones, and been a bit adventurous, trying out different styles. This is how it started, wanting to make stickers, as I’d found a packet of sticker paper while looking for something to do. I really liked the results, and have just kept going. At this rate, I’m going to run out of ink in my brand new markers I bought. At least I’m having fun! Getting Christmas back on track. My partner blabbed to someone that they were getting one of my Christmas cards, so, on the way to find the duct tape to silence him, I started gluing together layers of Christmas paper and writing a calligraphy message to our friend receiving this card. 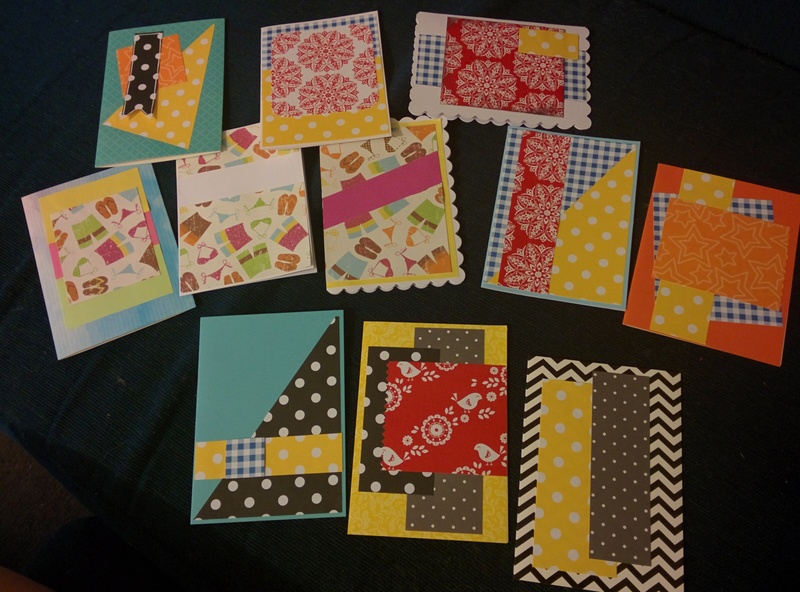 I’ve already remade half the mess that I had cleaned, again, so I may as well get stuck into card making. I have small boxes filled with layering papers, sentiments, images and ribbon, so I should be able to get some done easily. 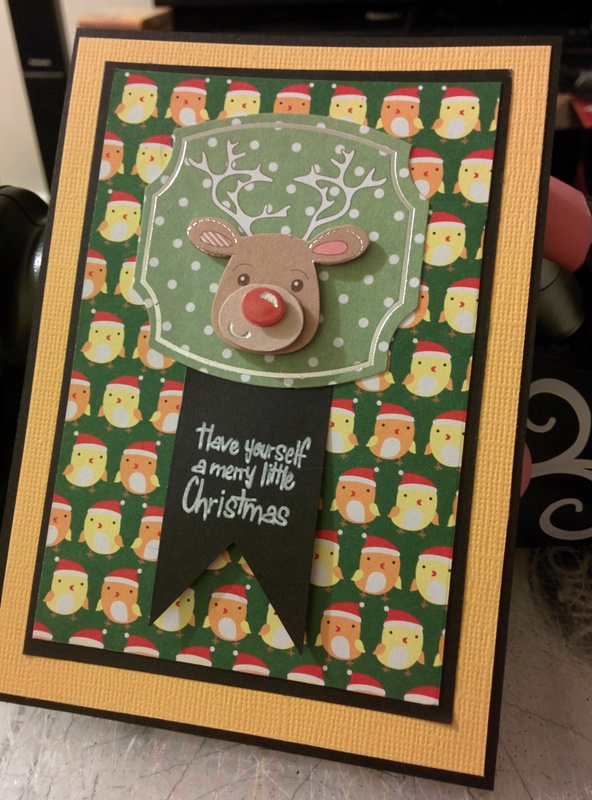 Perhaps, tomorrow, I’ll put a Christmas card making playlist on YouTube, and craft along, collecting ideas as I go. I didn’t intend to make a lot today, but I sat down for a while, and this happened. 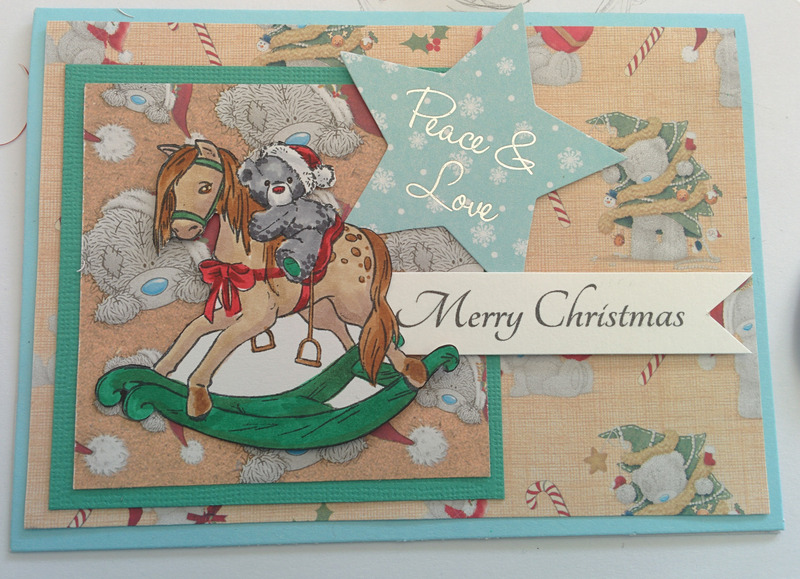 I’ve been wondering whether to continue making Christmas cards, or make everyone a hand decorated ornament each. It seems a bit quicker to do the ornaments, depending on how elaborate and detailed they are, but it might be a nice change to cards. Also, you can look at the ornaments each year, but it’s rare you see your Christmas cards a lot. It was always really fun putting up our personalised decorations on the tree when I was little, and thought it would be nice, despite not having any children in the family. 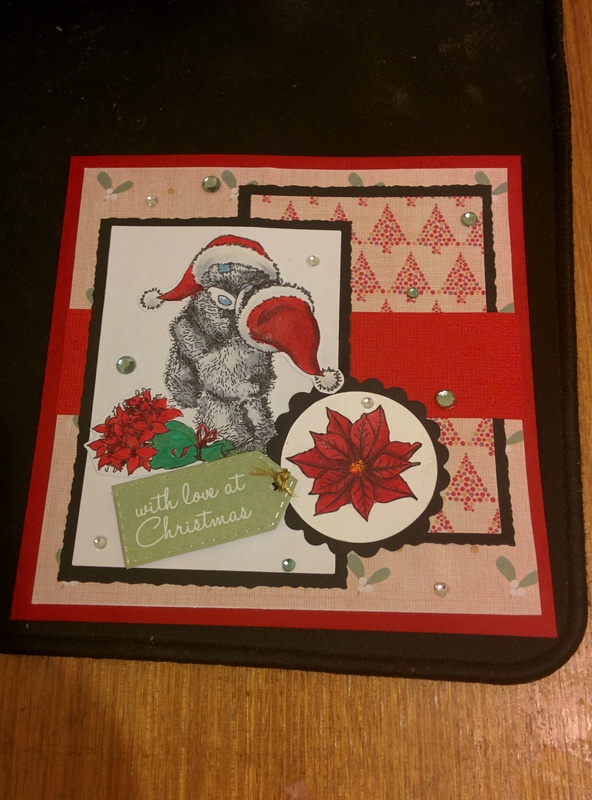 But I am getting quite sick of card making at the moment. I need to figure out soon, as I won’t have time to do both. 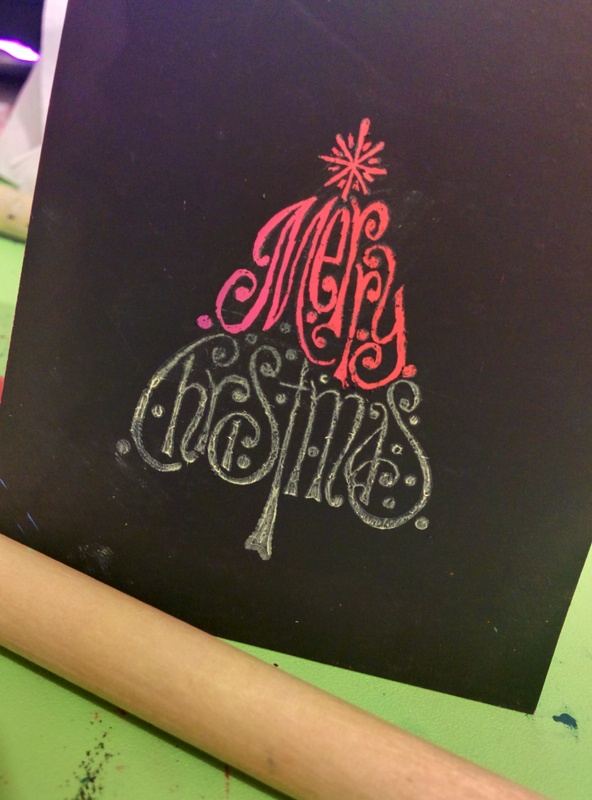 Today, I had the thought of stamping in yellow chalky ink, so I could scrape the black off the scratching paper (scraperpaper?) in a nice Christmas design. Since you only get one chance to draw into the paper, it’s nice to have a plan to follow. I covered this piece with contact to prevent future scratching. Just make sure you don’t peel the contact off if you misplace it, as it will remove all the detailed work you put in. I wonder if laminating would work, since there is plastic in the paper. I bought some laminating pouches to try this, as well as laminating colourful paper to turn into more scraperpaper. I have some contacted paper with drying black paint on it at the moment. I made some pieces with oil pastels, but you can’t get as great detail, because the paint tends to come up slightly clumpy. Hopefully I will be able to experiment quickly, and can implement this I to my cards. It is quite fun, but gets a bit messy with the paint and oil pastels. But mess just means I’m being creative. You should see how messy my house is. The time has come. The Christmas paper is out, the dimensional adhesive is flying, and there is ink everywhere. I was thinking about how cards evolve from year to year, as we pick up new skills, tools and supplies. Two years ago, I made all my cards without my Big Shot machine, and this year, I have heaps of new dies and a heat gun. Not to mention new paper that comes out. I even found a new Christmas stamp set yesterday, and bought a magazine, with more stamps and card making supplies, today. I should be all set for making, I just have to work out how many I need. One really handy item that I also picked up yesterday, was a Uni-ball Signo Broad white gel pen. I’ve had plenty of white gel pens, and they all get stuck and make a weird line where the pen makes two lines instead of the one you want, if it works at all. I even had the regular Signo gel pen, thinking it was just the same, but boy, was I wrong. I had seen some great card makers and artists use the broad pen, and I thought they edited out all the trouble of getting the pen to work, but it wasn’t. This pen actually works. Brilliantly. 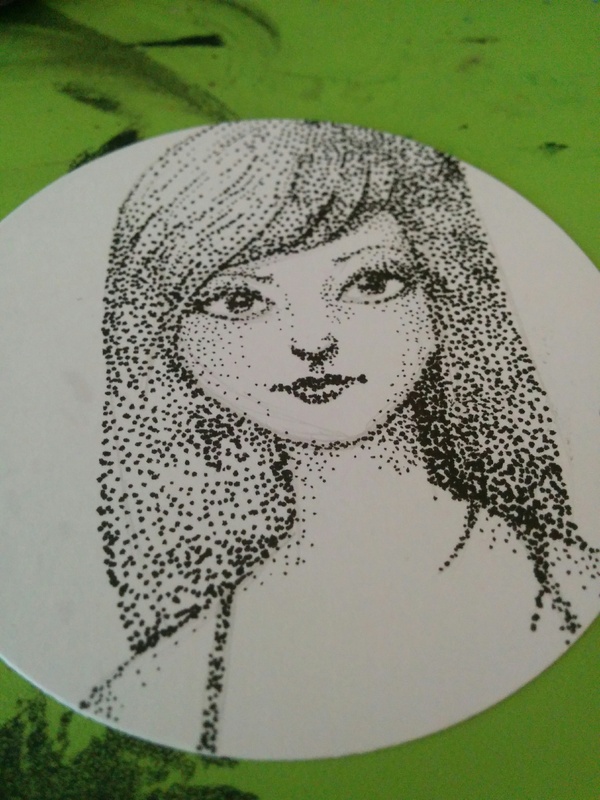 As the name suggests, it does produce a much thicker line, but it is so vibrant against black, and you can even make small dots with it, despite it having a ballpoint. I would definitely recommend this pen. 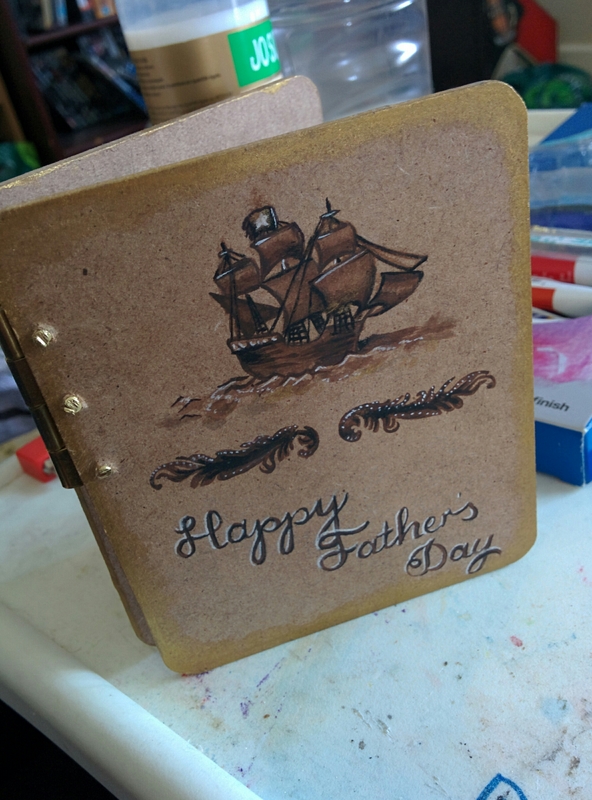 I thought I’d share a card I made for my Father in law, since I can’t show you much else that I’ve been working on. My partners Father likes carpentry, so we decided to make a wooden card. The biggest challenge with this was finding a small hinge. Unfortunately, the one I found was still too big for the coasters that I bought for the card. I ended up having to hack saw off the ends of each screw, which took a while. Luckily they weren’t too sharp after a couple of whacks with a hammer. For the painting, I stamped the ship and flourishes, then drew the writing with a pencil before painting over it. I added gold paint to the back and inside, and it worked it nicely. Today, I needed a break from hand sewing, so I began designing some clothes, which lead to me beginning to sew a skirt, using an old pair of jeans and some nice thick white satin with yellow rosebuds on it. Hopefully it works out and I can wear it in summer. I’m always nervous wearing my own creations because, even though I know it’s secured well, maybe even better than shop bought, I think it will fall apart. Maybe I have to wear it around the house for a bit. If I get over this, I could make and wear a lot more clothes.